Our favourite hideaways all have one thing in common: seriously beautiful interiors. 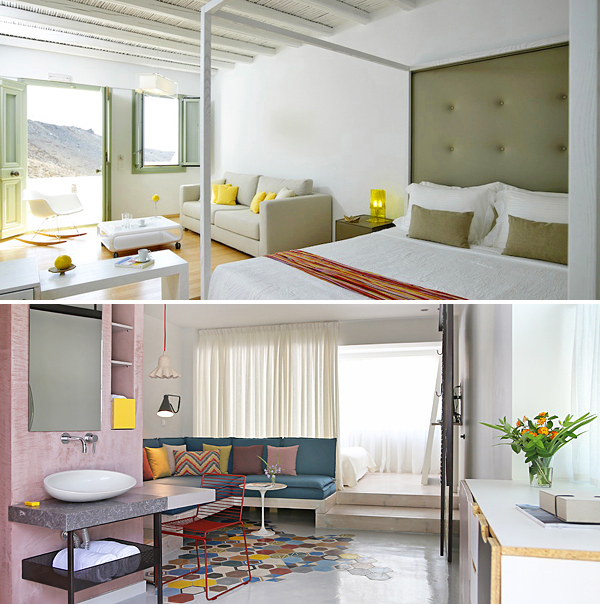 We thought it was high time we showed them off, so each month our Assistant Editor Abi (a self-confessed design addict and the person behind interiors blog These Four Walls) will round up the best-dressed places to stay one of our featured destinations, starting with Greece. She’ll look at what makes each special, and give tips to help you recreate the look at home. A quick warning: reading may induce serious house envy! 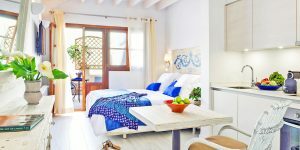 If you think Greek décor is all about blue shutters, rustic wooden furniture and terracotta floors, you’re in for a surprise. Today’s designers are pushing the boundaries, reinterpreting traditional Mediterranean influences and combining them with oodles of contemporary style. We’ll start on the island of Ithaca, where Villa Kalos sits in a sea of olive and almond trees. Kalos means ‘beautiful’ or ‘handsome’, and it’s an apt name for this rambling old abode, which has been given a slick makeover by its photographer owners. Inside it’s all cool greys and whites, with exposed stone walls alongside swathes of polished concrete. 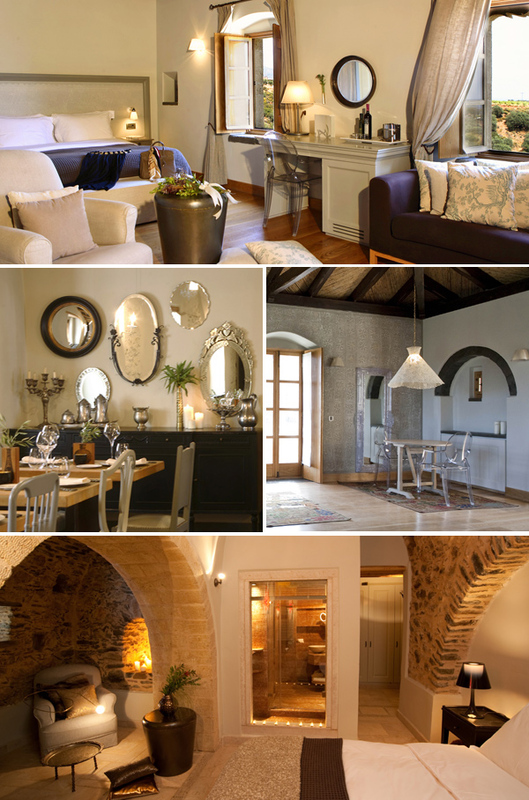 The 4 bedrooms come with low-slung beds and smart steel lamps, while the open-plan living area has a fantastic blend of old and new – gnarled farmhouse tables flanked by designer chairs, boxy sofas around a coffee table made from salvaged pallets, and open shelves brimming with vintage crockery. Idea to steal: Use contrasts to create a striking look. Mix smooth and textured surfaces or furniture from different eras, and place light and dark colours together. Over on remote, rugged Astypalaia is another example of modern Greek style, this time with a subtle nautical twist. 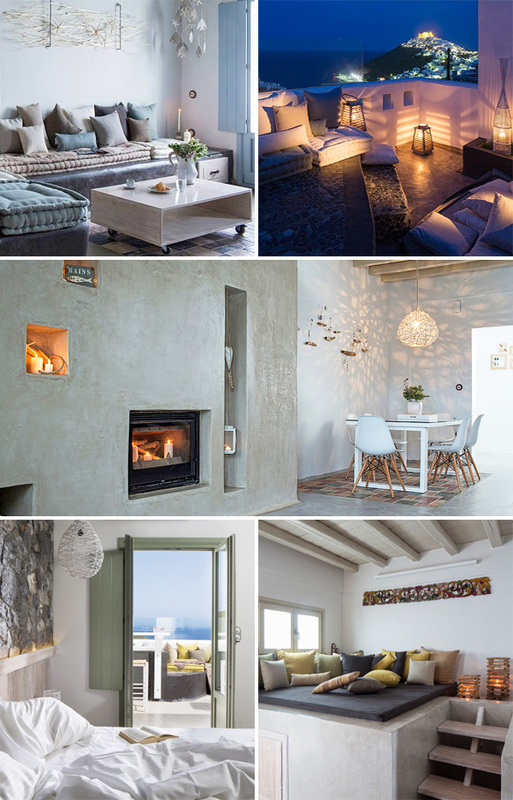 This trio of hillside houses for 2-6 (all with sea views and Jacuzzis) makes a big play on natural textures: there are low-hanging light shades woven from twisted wicker, lanterns fashioned from driftwood, bathrooms with pebbled floors, and headboards made from weathered timber. Clever built-in storage nooks and seating moulded from smooth plaster keep everything looking sleek and clutter-free. The overall effect is beachy and breezy – perfect for lazy summer escapes. Idea to steal: Conjure up memories of sun-drenched holidays by using beach finds in unusual ways – turn shells into tea-light holders, stack colourful chunks of coral inside glass vases, or suspend driftwood from wire to create quirky wall hangings. 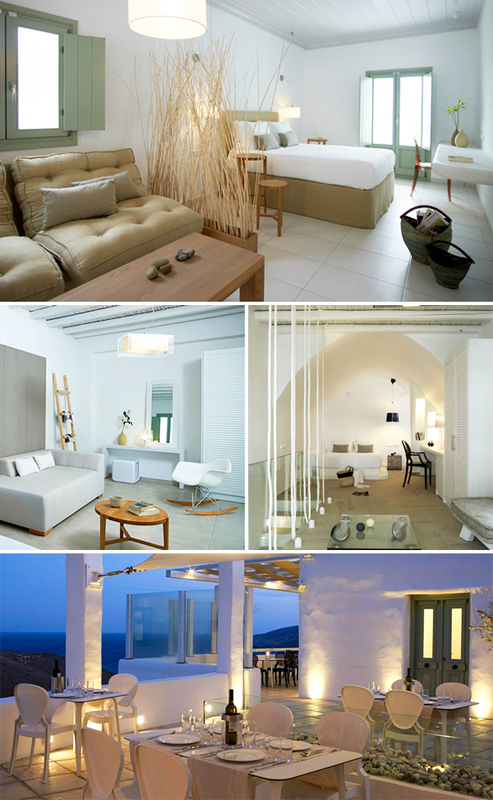 If you need to soothe a busy mind, the serene interiors at Pylaia Hotel (also on Astypalaia) will do the trick. The rooms, lobby and restaurant all have dazzling white walls that frame the azure sea outside, and subtle splashes of colour are incorporated through cushions and ceramics in soft shades of duck-egg blue, sunshine yellow and sage green. As for the furniture, it’s a clean-lined mix of Eames rockers, low couches and box-framed beds, with clever reed screens that create cosy corners within open-plan spaces. Idea to steal: Use neutral colours to achieve a restful background ambiance, then jazz things up by adding colourful textiles and occasional prints. Greece’s Byzantine past is on show at this 13th-century manor house turned romantic spa hotel, perched above olive groves and vineyards near the medieval city of Monemvasia. The building’s beautiful original features – huge stone hearths, vaulted ceilings, frescoed walls – have been retained and restored, and now sit alongside lustrous silks, flocked wallpaper, gilded mirrors and chunky pillar candles. There’s also a sprinkling of designer pieces, including perspex ‘Ghost’ chairs by Philippe Starck. It’s opulent but not over the top – a tricky balance to achieve. Idea to steal: Group together candles and mirrors of varying sizes to create eye-catching displays. Kids big and small will adore the Alice-in-Wonderland feel at this funky, family-friendly beach retreat in the mainland region of Chalkidiki. Every room is different: some echo traditional blue and white schemes through geometric tiling and clashing prints, others are loft-like spaces with a distinctly retro flavour. There are plenty of whimsical touches in the communal areas, too: parasols designed to resemble giant lampshades by the pool, oversized armchairs on the beach, plastic Panton chairs in reception, even a multi-level alfresco lounge wrapped around a tree. Idea to steal: Forget the rules and have fun with design! Above all, your home should be somewhere that makes you smile. 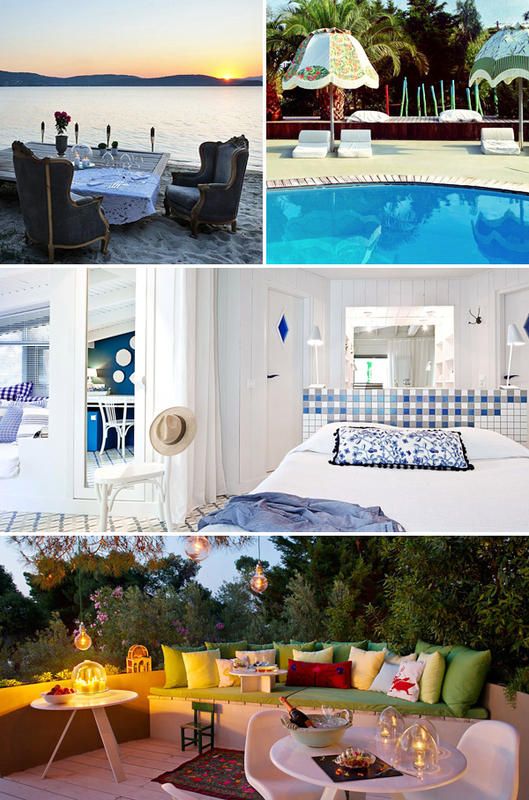 For more inspiration, see our full collection of boutique hotels in Greece.